175 Marlborough is located on the north side of Marlborough, between Dartmouth and Exeter, with 173 Marlborough to the east and 177 Marlborough to the west. 175 Marlborough was built for building contractor Silas Whiton Merrill ca. 1871, for speculative sale, one of two contiguous houses (175-177 Marlborough). He purchased the land for 175 Marlborough from the Commonwealth of Massachusetts on June 22, 1871. Click for an index to the deeds for 175 Marlborough. On October 19, 1872, 175 Marlborough was purchased from Silas Merrill by commission merchant Charles Lowell Andrews. He and his wife, Sarah Augusta (Jeffries) Andrews, made it their home. They previously had lived at 220 Beacon. By the 1877-1878 winter season, 175 Marlborough was the home of Rev. Phillips Brooks, Rector of Trinity Church. The Andrewses lived primarily in Milton, but also continued to list themselves in the Blue Book at 173 Marlborough, which had not yet been built. Rev. 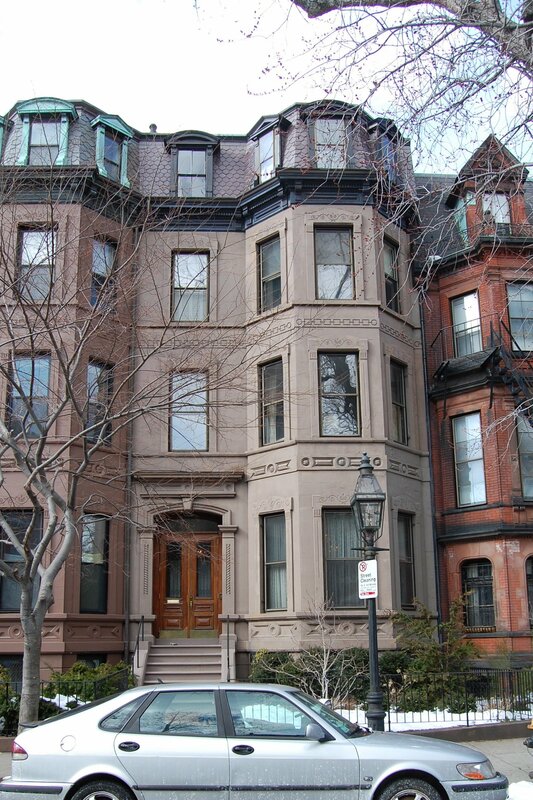 Brooks continued to live at 175 Marlborough during the 1879-1880 season, but moved thereafter to the newly-completed Trinity Church Rectory at 233 Clarendon. During the 1880-1881 winter season, 175 Marlborough was the home of merchant and ship owner George Bruce Upton, Jr., and his wife, Geraldine Ipolite (Russell) Rivers Upton. They had lived at 105 Marlborough during the previous season. They also maintained a home in Milton. 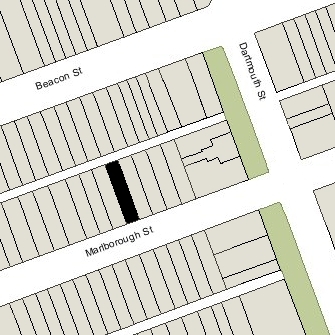 They had moved from 175 Marlborough by the next season and by the 1882-1883 season were living at 171 Marlborough. In 1882, 175 Marlborough was the home of Richard Olney and his wife Agnes (Thomas) Olney. They had lived in Forest Hills in 1880. Richard Olney was an attorney and later would become US Attorney General and Secretary of State under President Grover Cleveland. By 1883, they had moved to 241 Marlborough. By the 1883-1884 winter season, 175 Marlborough was the home of George Quincy Thorndike , an artist, and his wife, Ellen (Lewis) Thorndike. They previously had lived at 258 Beacon. On February 16, 1886, he purchased 175 Marlborough from Charles Andrews. George Thorndike died in December of 1886, and Ellen Thorndike continued to live at 175 Marlborough. Their three children – Harry Hill Thorndike, Mary Hamilton Thorndike, and Richard King Thorndike – lived with her. Mary Thorndike married in April of 1897 to John Brooks Fenno, Jr, a dealer in iron and coke. After their marriage, they lived at 254 Beacon. During the 1898-1899 winter season, Ellen Thorndike was living elsewhere and the Fennos lived at 175 Marlborough. By the next season, they had moved to 255 Commonwealth. 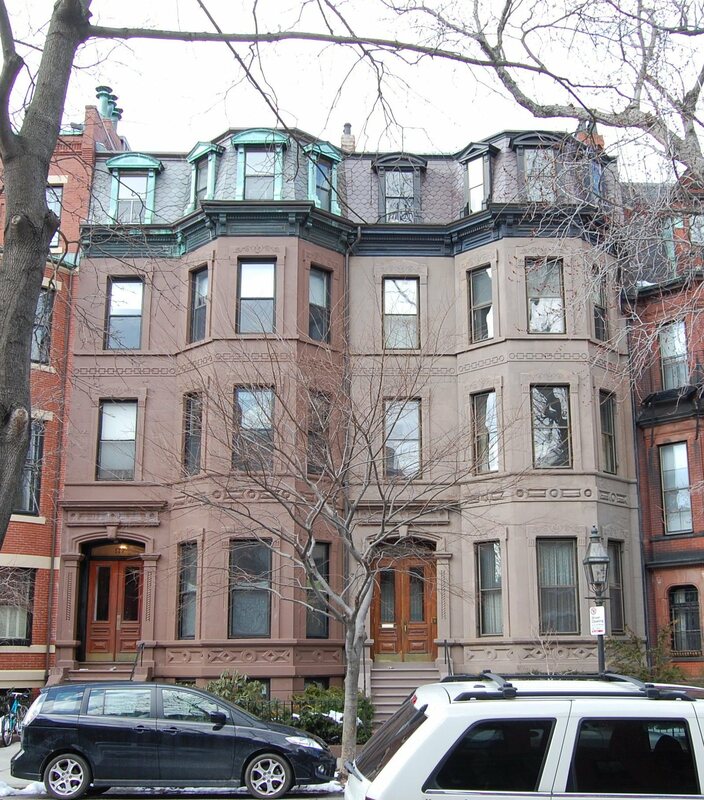 During the 1901-1902 winter season, Ellen Thorndike was again living elsewhere and 175 Marlborough was the home of Louis Cabot and his wife, Amy (Hemenway) Cabot. They also maintained homes in Brookline and Dover, New Hampshire. Ellen Thorndike resumed living at 175 Marlborough by the next season. Harry Hill Thorndike and Richard King Thorndike continued to live with her (when not traveling abroad) until their marriages. Harry Hill Thorndike, an architect, married in July of 1903 to Lucy Barney Gurnee, after which they moved to Washington DC. Richard King Thorndike married in May of 1908 to Florence Adele Macy; by 1910, they were living in Millis, where he owned a farm. Ellen Thorndike continued to live at 175 Marlborough until her death in November of 1915. By the 1916-1917 winter season, 175 Marlborough had become the home of Harry Hill Thorndike and Lucy Barney (Gurnee) Thorndike. They had been living in France and had returned in about 1915, after which they lived in Newport and probably also lived with his mother at 175 Marlborough when in Boston. They continued to maintain a home in Newport and later also in Bar Harbor. On January 8, 1918, Harry Hill Thorndike purchased his siblings’ interests in 175 Marlborough. During the 1924-1925 winter season, the Thorndikes were traveling abroad and 175 Marlborough was the home of Frederic Munroe Burnham, a stockbroker and trustee, and his wife, Rosamond (Eliot) Burnham. They previously had lived in Manchester. By the 1925-1926 season, they had moved to 291 Commonwealth and the Thorndikes were living at 175 Marlborough again. Harry Thorndike died in April of 1938. 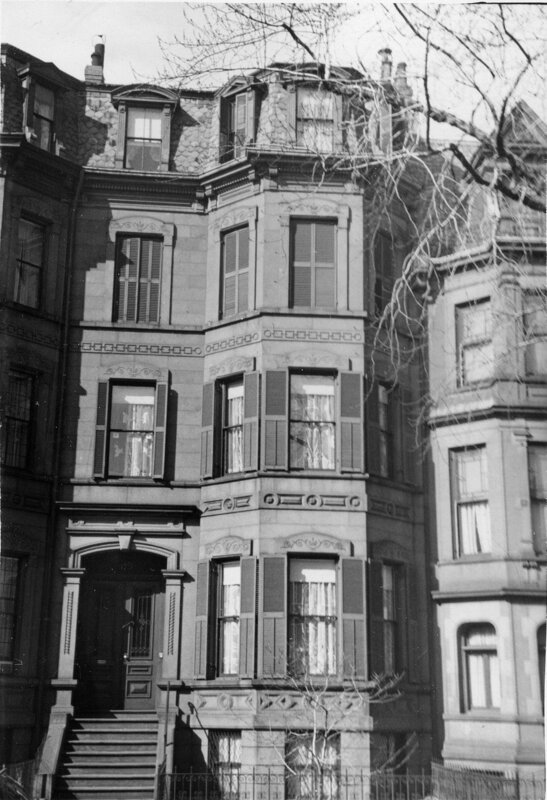 Lucy Thorndike continued to live at 175 Marlborough until her death in June of 1967. On February 5, 1968, 175 Marlborough was purchased from Harry Hill Thorndike’s estate by Ronald L. Prosser, David T. O’Brien, Donald A. Dean, and Leo T. Hart, trustees of the One Seventy Five Marlboro Trust. In January of 1968, prior to taking title to the property, Leo Hart filed for (and subsequently received) permission to convert the property from a single-family dwelling into seven apartments. On December 22, 1977, 175 Marlborough was acquired from Leo Hart, remaining trustee of the One Seventy Five Marlboro Trust, by John V. O’Neil, trustee of the 175 Marlboro Street Realty Trust. In May of 1978, he filed for (and subsequently received) permission to reduce the number of apartments from seven to five. On May 3, 1978, John O’Neil converted the property into five condominium units, the 175 Marlborough Condominium. On October 28, 1985, the unit holders amended the condominium master deed to reduce the number of units to four, and on November 29, 1992, the unit holders further amended the condominium master deed to reduce the number of units to three.